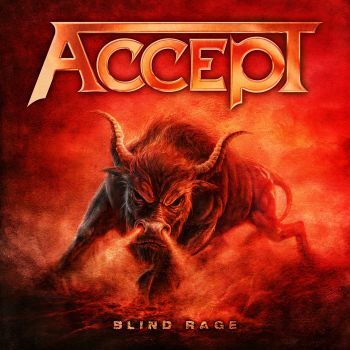 ACCEPT - BLIND RAGE VINYL (2LP BLACK) | Online Shop | Wizard LTD. Album: "BLIND RAGE VINYL (2LP BLACK)"
“ACCEPT&apos;s latest attack comes with red rage and rough, catchy riffs. THE BEST GUITAR RIFFS UNITE THE BEST VOCAL LINES! It is already one of the best pure heavy metal albums of all time! In the history of Heavy Metal not many bands can claim to be able to celebrate their breakthrough twice. ACCEPT managed this four years ago, as, with their reunion record »Blood Of The Nations«; returning with a vengeance by charting all over the World and topping critics’s and fan polls in the process. In their home country Germany, ACCEPT charted at an incredible #4 in the Media Control Charts, making this highest position in the band’s career to date. Built around the nucleus of band colleagues Wolf Hoffmann (guitars) and Peter Baltes (bass), with new vocalist Mark Tornillo as well as Hermann Frank (guitars) and Stefan Schwarzmann (drums), ACCEPT completed a global march of victory, peaking in a sold out tour and outstanding festival shows. The successor »Stalingrad« maintained the high level with, yet again, over 100.000 records sold, followed by numerous nominations as “record of the year”, a completely sold out world tour and overwhelming chart entries (#5 in Hungary, #6 in Germany, #8 in Finland, #16 in the UK Rock Charts, #17 in Switzerland and #22 in Norway, to name but a few). Now »Blind Rage«, the latest instalment in this amazing return, is ready to write history once more. The band’s creative streak has delivered a thunderstorm of riffs, only one Wolf Hoffmann is able to set aflame. Besides the “red ACCEPT-line”, as the band likes to call it, the only goal was to “remain interesting”. Another factor that has turned into an ACCEPT trademark, is the voice of singer Mark Tornillo. The New Jersey born musician has been the man behind the microphone since the ACCEPT reunion took off in 2009. Within the course of the three albums, he has grown into his role as frontman of these “teutonic terrors”. Wolf Hoffmann, who likes to call himself a “naturally born perfectionist”, praises his band colleague and states that “his accomplishment is outstanding”. The cover done by Daniel Goldsworthy (HELL) will hit you right in the eye. Grimly snorting, the proverbial beast, we all have inside of us, unstoppably stomps through the hellfire this world is becoming.